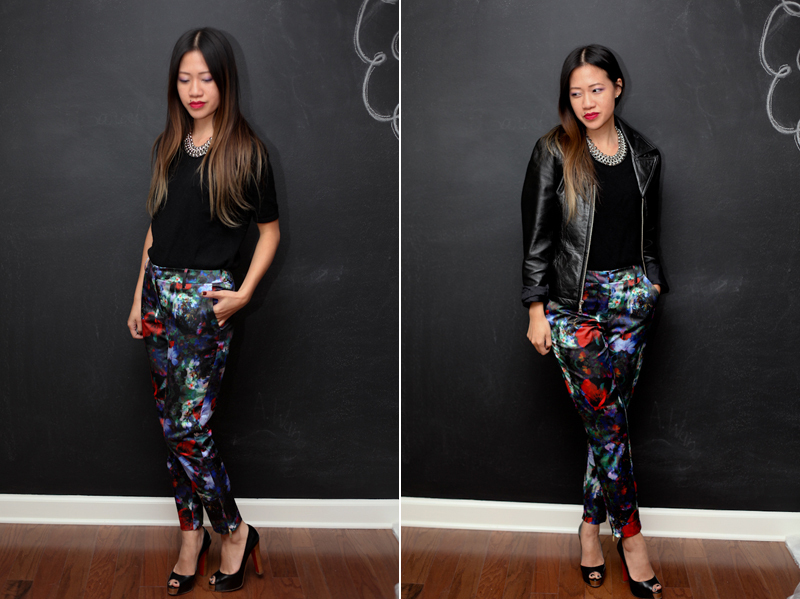 Wore this out to my fave fashionista Duyen's birthday gathering at the Tasting Room - been a bit obsessed with finding a pair of printed and or jacquard pants. i literally tried on 5 different pairs at H&M each fitting differently.. and badly. this one "fit" so i bought. maybe i have a problem. i've bought 2 more pairs of jacquard type pants since.. each still not fitting quite like they're supposed to. you know.. skinny and cropped. they all just look like trousers on me. WATS WRONG PANTS? Y U NOE FIT ME. yet i still buy you. i cant quit u.
i've been searching for awhile now for the perfect brocade pants. these are awesome on you! 2 thumbs up for the outfit, fabulous! amazing pants and great outfit altogether. You’re looking so attractive in this dress and the entire outfit is awesome and it suits you well. But actually I don’t like this kind of pants because it never suits me. Love those pants!! I've been pondering diving into this trend for so long that by the time I do, it will likely be over :( I sympathize with your cropped pants issue as well; I'm going to guess you are short b/c I am and I always have this problem where cropped = perfect pant length for me.